Discussion in 'Elections & Campaigns' started by JakeStarkey, Apr 13, 2019. Trump's persistent desperation in concealing the tax returns that he promised to share with Americans, in conformity with the normal practice of all presidential candidates, is a win/win for the nation. Either the truth now hidden in them is exposed, and the truth shall set us free, or he shall continually demonstrate his desperate need to hide them, and reasonable conclusions will be drawn from his furtive conduct . The House Ways and Means Committee has lawfully requested them. The American people, by a large majority, affirm their expectation that he should keep his promise and come clean. If Trump feels there are things he needs to hide that disposed him to lie about releasing them, he will persist in trying to hide them, and Americans, hellbent on transparency, will persist in demanding them. 1) Not a legal requirement the office being sought. 2) They are trying to force exposure of private information that is protected by Federal law. The Dems will lose in court, but of course they don't care about that. They're only concern is to simply keep attacking Trump. TrackerSam and Injeun like this. Watch this. This comes from an actual lawyer. What part is that they volunteered don't you get? That's freaking Jay Sekulow, who is a pretend lawyer and is pitching a very ****ed up view of the law. Since when are they going to make it public? Congress has the right to the returns under existing law, and Bonespurs J. Bumbledumb is using government to thumb his orange nose at the law. This is unacceptable under our system. And, no--the Dems won't lose this one. The statute is very clear. If Trump would prefer that Americans persist in demanding that he come clean with his tax returns in compliance with the practice of all other presidential nominees, as he promised he would do, he will continue to defy public opinion and the law. ... Ways and Means Committee Chairman Richard Neal, D-Mass., has requested six years of returns, relying on a provision written into tax law passed in 1924. Trump’s chief of staff, Mick Mulvaney, curtly responded that Democrats would “never” see them. Trump’s personal lawyer, William Consovoy, cited a nonexistent limitation that Congress needed a legitimate legislative reason before it could obtain them. 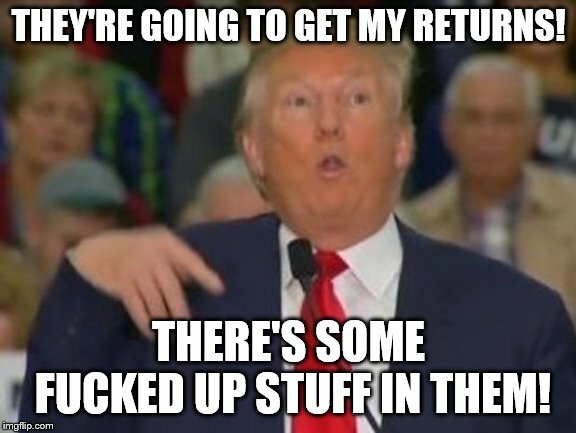 Trump asserts that he'd love to release his returns but can't because he's under audit. That's bogus. That proves he lied when he said he was a wealthy billionaire. Did Trump burst your bubble again ? What part of “every presidential candidate since Nixon” don’t you understand? I know that you’re old, but since when does that mean “not understanding a damned thing”? I'm pretty sure that President Ford never released his tax returns. That's correct, Mr. "Presuhdint". Congress has an absolute right to the returns under 26 USC Sect. 6103. But he did release tax return summary information. The only thing "bursting" are the buttons on his clothing. He keeps gorging and getting fatter and fatter. The Germans call that "kummerspeck", literally "grief bacon". The kind overeating when you're stressed. Seems to me that a State that supersedes or eclipses federal election guidelines has effectively absolved itself from participation in the federal election process. He would've charged into battle with no weapon if he had to! Uh, which misses the point by a mile. 26 USC Sect. 6103 gives Congress the right to anybody's returns. So far the statute has only given congress the right to REQUEST anybody's returns ... you've missed that point by a mile. Statutory analysis isn't your bag. What point would there be in allowing a "request" without a corresponding obligation to provide what was requested? "the Secretary shall furnish such committee with any return or return information specified in such request-----"
Read the statute before posting. Germany as a country has become a kummerspeck. Why request at all then? Why not just have the congressional "sergeant at arms" go and seize it? Congress doesn't issue empirical decrees OK. There are legal provisions that allow all subpoenas to be challenged. Congress has to prove investigational necessity. It can't, they know it. It's all about the 2020 memes ... conspiracy ... cover up ... corruption ... two scoops! If Trump hadn't gone to college when applying for a student deferment was part of the process when registering for school, it was SOP back in the day, Trump more than likely would have been inducted in 1965 and found himself like most draftees who were drafted in 65 eating bratwurst in Germany. 2.5 million were drafted during the Vietnam War era (65-73), around 8 million had deferments mostly student deferments. I don't know why you posted a laughing emoticon when you completely hosed up your own analysis. They make a "request" for the returns because the statute requires a request as a prerequisite (here's where you quit reading the statute) to being "furnished" with the returns. You're welcome for the lesson, my friend. Why do Repubs Not want to see Trump's returns if you trust him? So, it's OK for treasury to ignore the law? The Treasury submitted the congressional request to the DOJ. The Treasury brought it to the attention of law enforcement.